Wind energy has been harvested for centuries for various applications. Because of its long history, the use of wind to generate electricity remains as one of the most reliable forms of energy generation. Even though wind as a resource is often variable, technologies exist to integrate this energy source into both small and large power systems whilst still producing large economic and environmental benefits. questions (FAQs) about wind that may answer some of your questions. Why should I use wind power? Are wind turbines noisy and ugly? Sunshine gives rise to winds because uneven heating of the atmosphere results in pressure differentials and the fact that the air will move from an area of high to low pressure. Wind power is one of the oldest forms of sustainable energy. Farmers have for generations relied on the wind to pump water for their livestock, crops and themselves. Wind power harvesting techniques have come a long way since then and the kinetic energy of wind is now converted directly into electricity. Although wind turbines output mechanical power, which can be used for pumping water, most turbines convert mechanical power directly to electricity through the use of a generator. Large turbines, upwards of 50kW, are often grid connected, and usually grouped together to form wind farms. Medium sized turbines however are more versatile. They are generally used to power farms, houses or businesses and even small communities. The main advantage of these turbines is that they deliver power to where it is needed, usually to rural and remote areas where mains power is unavailable. Finally, there are the small turbines, up to a few kW. These turbines are ultimately portable and effective for charging batteries on sailing boats, cars, and caravans and for powering monitoring and data logging equipment. In areas that experience both a large power demand and a high average wind energy density, wind farms are very attractive business opportunities. These farms are essentially an array of interconnected turbines in a localised area. The turbines are placed so they can best harvest the wind without interfering with each other or the local residents. Typically a utility company will lease the land off the current owner. Agricultural or pastoral properties are often used for wind farm sites as the turbines do not interfere significantly with the existing land use. Good sites for wind turbines are often surrounded by flat land or are themselves on hilltops or ridges. The smoother the surrounding landscape, the better. The ideal wind resource is a steady air flow and moves at a rate of 6 meters per second or more. The most profitable sites exhibit regular, strong wind. These are usually remote locations as they are not considered ‘pleasant’ by human settlers. Coastal areas are generally well suited as twice a day there is a large temperature differential between the land and the sea, providing good, strong and reliable winds. Offshore areas are also being considered (especially in Europe), as there is less turbulence and generally stronger winds though the towers have to stand up to a harsher environment. Once installed, operating and maintenance costs are very low. Wind turbines are very reliable at around 99%, which is more reliable than coal-fired steam turbines that run at around 97%. Another primary advantage is zero CO2 emissions. For every 50MW of wind generation, 50,000 to 115,000 tons of CO2 emissions can be offset. Because wind turbines can be situated close to where the power is used, transmission losses, that can be as high as 10%, are also avoided. This adds a significant energy saving. In terms of embodied energy, a large modern wind turbine will produce more than 50 times its energy cost over a 20 year lifetime. Because of their small footprint, wind turbines are also among the most efficient in terms of land usage. As a disadvantage common to many renewable energy sources, wind power has a high initial investment cost. In addition, wind is a variable resource. This means that in situations where wind energy contributes a large portion of the total energy demand, some form of energy storage is required. Another often heard complaint about wind turbines is noise pollution. The most audible noise created by a wind turbine is the whoosh-whoosh-whoosh of its blades interrupting the airflow when they pass the main tower. The noise of the gearbox and generator is usually inaudible unless one is standing at the foot of the tower. A wind turbine’s noise increases with wind speed, but so does the background noise (leaves rustling etc.) and so the actual audible noise will depend on surroundings. In Australia, wind farms are placed at least 400m from homes though in Europe 100m is common. The noise from a wind farm is less than that of a busy road at the same distance. Although most people find wind turbines to be graceful and visually spectacular, some consider them to be industrial, ugly and a blight on the landscape. That is why the visual amenity of a wind farm is usually the dominant issue when wind farm proposals are reviewed. People find the most aesthetically pleasing tower height to be roughly equal to the rotor diameter. All turbines in a given farm should be roughly the same size and visual appearance, with grey to off white being the best colour. The old windmills relied on ‘drag’ to turn their blades and at best had a blade speed almost equal to the wind speed. This gives them a tip speed ratio of around 1. Because of this they were good for large torque at low speeds. As a result they were not very efficient. Electrical generators require high-speed operation to achieve good mechanical to electrical energy conversion efficiency. Around 1500 rpm is the normal nominal speed for a four-pole generator. The more poles, the slower the machine can turn but adding poles adds weight and often a reduction in efficiency. Nowadays wind turbine blades operate using the principle of ‘lift’ and so they can achieve faster blade speed than wind speed, thereby operating much more efficiently. Typical tip speed ratios on large ‘lift’ type turbines are around 10. The theoretical limit of efficiency for a wind turbine is 59.3%. This is known as the Betz limit. Practical blade efficiencies of 35 to 45% have been realised though total efficiency of the turbine is still only 10 to 30% (figures courtesy of the Iowa Energy Centre). Generally wind blows past a turbine’s blades, causing lift. Due to the angle of the blades, this lift is converted into rotational torque, hence spinning the turbine’s blades. In large machines, the blades are generally connected to a gearbox where the rotational speed of the turbine is shifted up to around 1500 RPM, and fed into a four-pole induction generator. This creates AC current at 50 Hz. In smaller generators there is often no gearbox and instead, a permanent magnet generator is used to produce DC electricity that can be fed through an inverter to create 50 Hz AC power. Most turbines have three blades because it reduces the noise, wear and vibration and increases the efficiency over a two-blade system. More than three blades results in a higher Reynolds Number. This number gives an indication of the type of airflow over the blades. The lower the Reynolds number the less turbulent the airflow and hence the more efficient the turbine. A higher number of blades also means that each blade operates in the turbulence of the preceding blade. The materials used to build the blades are usually glass-reinforced or carbon-fibre-reinforced plastic though for small turbines wood epoxy is sometimes used. Larger turbine’s towers are usually tubular steel though a few are pre-stressed concrete. As the turbine size decreases so does the tower material change from tubular steel, through steel lattice to aluminium lattice for some of the smaller turbines. The power delivered by the wind increases as the cube of the wind speed, and also by the square of the radius of the turbine blades. Because of this it is most financially efficient to have very large turbines. Wind power can be a very cheap source of renewable energy, costing between 5 and 8 cents per kilowatt-hour, when commercially produced and in large projects. Smaller turbines are usually used for stand-alone applications where the grid is not accessible. Grid connected turbines can be anywhere from 50 kW to 4 MW. The turbines are generally placed on high towers (up to 80m), depending on terrain and turbine power rating. This is so they are out of the ground turbulence and so they can catch the stronger winds. The following table gives some idea of the rotor diameter for given kW ratings. Before making any decision it is important to do a full wind resource assessment before undertaking a feasibility study to find out if the area is suitable for wind power generation. Further information on how we can help is located under the Services area of our website. 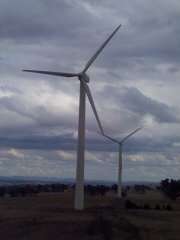 Further information on wind energy and wind turbines within an Australian context can be found at the Research Institute for Sustainable Energy website. Additionally, the wind turbine Wikipedia article can provide further information about different wind turbine types and their use at a global level.